University of Georgia Press, 9780820346007, 216pp. Someone dies. What happens next? One family inters their matriarch's ashes on the floor of the ocean. Another holds a memorial weenie roast each year at a green-burial cemetery. An 1898 ad for embalming fluid promises, "You can make mummies with it " while a leading contemporary burial vault is touted as impervious to the elements. A grieving mother, 150 years ago, might spend her days tending a garden at her daughter's grave. Today, she might tend the roadside memorial she erected at the spot her daughter was killed. One mother wears a locket containing her daughter's hair; the other, a necklace containing her ashes. What happens after someone dies depends on our personal stories and on where those stories fall in a larger tale--that of death in America. It's a powerful tale that we usually keep hidden from our everyday lives until we have to face it. 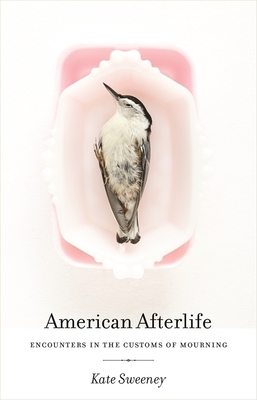 American Afterlife by Kate Sweeney reveals this world through a collective portrait of Americans past and present who find themselves personally involved with death: a klatch of obit writers in the desert, a funeral voyage on the Atlantic, a fourth-generation funeral director--even a midwestern museum that takes us back in time to meet our death-obsessed Victorian progenitors. Each story illuminates details in another until something larger is revealed: a landscape that feels at once strange and familiar, one that's by turns odd, tragic, poignant, and sometimes even funny. KATE SWEENEY is an Atlanta-based writer and public radio storyteller and producer. Sweeney's radio stories air regularly on Atlanta's NPR station, and she has won a number of Edward R. Murrow awards and Associated Press awards for her work. Her writing has appeared in Oxford American, Utne Reader, Atlanta Magazine, New South, and elsewhere.